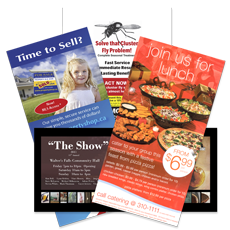 Rack cards can be used as direct mailers, with or without names embedded and fit in a standard business size envelope for addressed mailings or inclusion with a cover letter. The long format makes them ideal for use in display units "racks" which is how they got their name. Rack cards are available in 3 popular sizes (vertical or horizontal), can be single or double-sided and are offered in a variety of finishes. Optional UV 1 side only) and 13 pt 100% recycled stock – with no coating. Finishing Options:Corner rounding, die cut holes & shapes.